TX92G Series are discontinued. 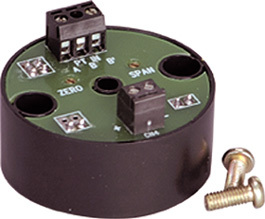 As an upgrade substitute, please check out the new TXUN temperature transmitter for details. The economical OMEGA™ TX92G transmitter provides an output current of 4-20 mA proportional to the mV signal of a two wire RTD sensor input. The TX92G is very compact and mounts directly with OMEGA’s NB1 cast iron protection heads. 참고: *Insert range code from chart below. All units come with complete operator’s manual. For complete information on NB1 Thermocouple Probes and PR-12 RTD Probes, see Sections A and C of the Temperature Handbook.